A curly haired girl with a creative twirl! 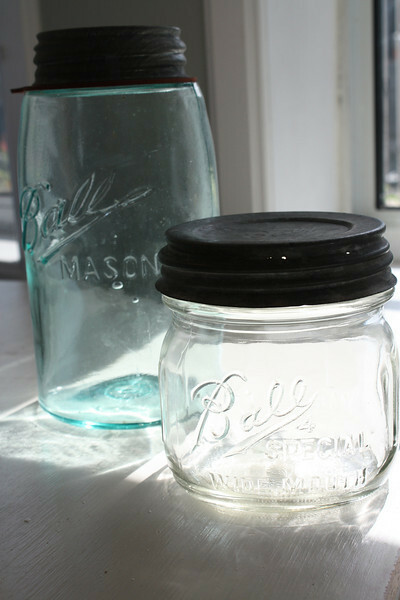 I've always loved antique Mason jars and I've found so many uses for them. 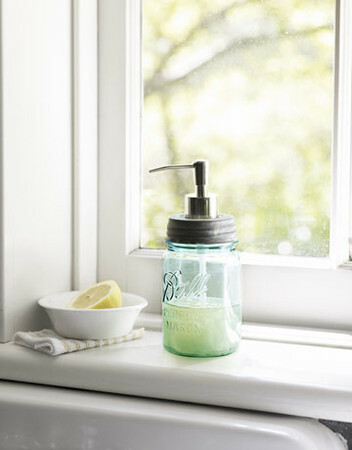 They are wonderful for repurposing projects and in 2010 Country Living Magazine had a great tutorial to convert them into a super cute soap dispenser. But when I began seeing them in magazines this year as Holiday decorations, my wheels started turning. I love taking something old and making it new again, and well, I knew I had to give these a try! 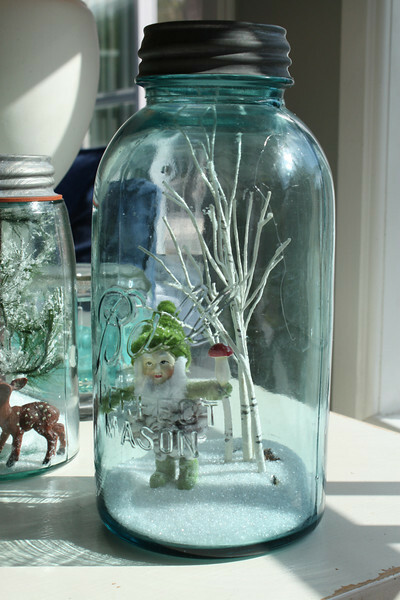 The result was a fraction of the cost of buying a Mason Jar Snow Globe from a catalog, and in my humble opinion, something way more special. 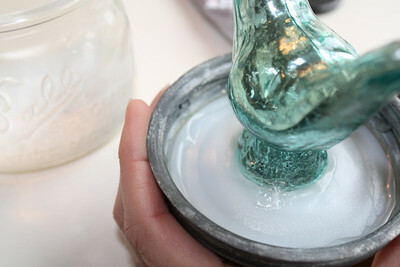 I started searching the Internet for tutorials and found this one on Martha Stewart that uses any household glass jar with a lid. I used this as my guide. 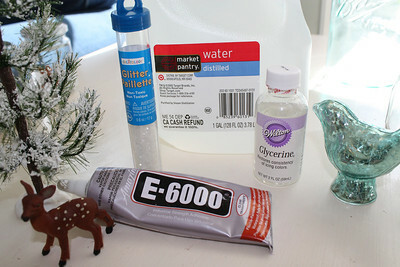 *I'm using E-6000 glue because that's what I had on hand and it worked fine but Epoxy glue is best (especially if you are using any type of glass ornament or glass figure in your jar). Do not use a hot glue gun. 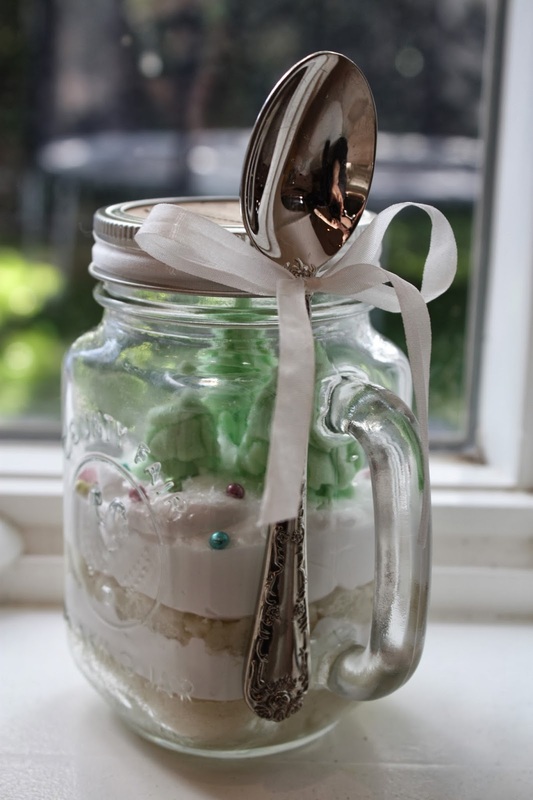 I came up with the idea for terrariums because there were so many cute things I found to go in the mason jars that wouldn't do well with water. These are a dry decoration, so problem solved. The tree and the little deer were purchased at Michaels. 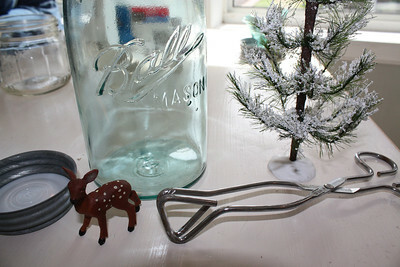 Apply glue to the bottom of the deer's feet and position on the bottom of your jar with tongs. 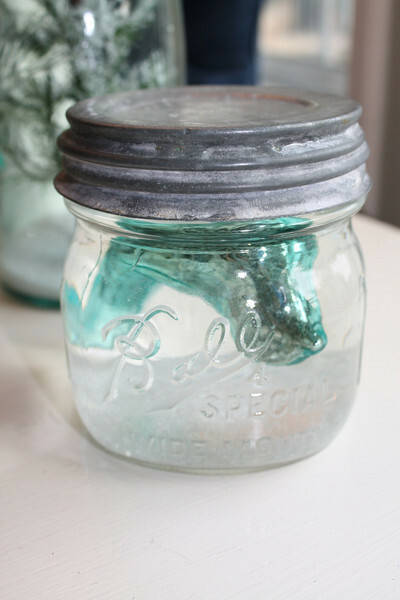 This is a 1 quart blue glass vintage Mason jar. 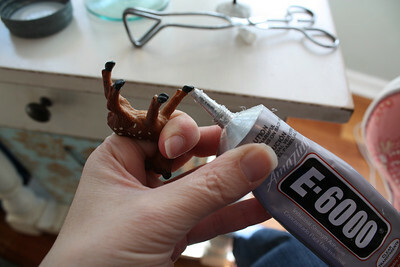 Allow glue to set so that the deer is stable and then add the tree, repeating the same process. 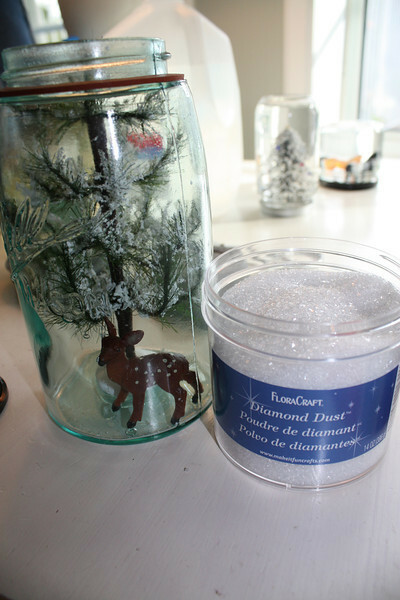 Spoon in desired amount of Diamond Dust (also purchased at Michaels). 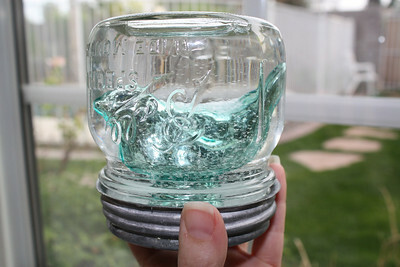 Screw on the lid and put your gorgeous vintage looking terrarium on display! 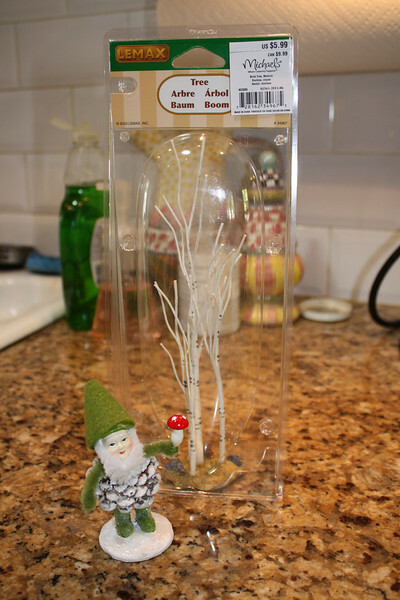 I found this darling little elf like gnome at Cost Plus and the white tree at Michaels. I knew these two would be terrarium bliss together. 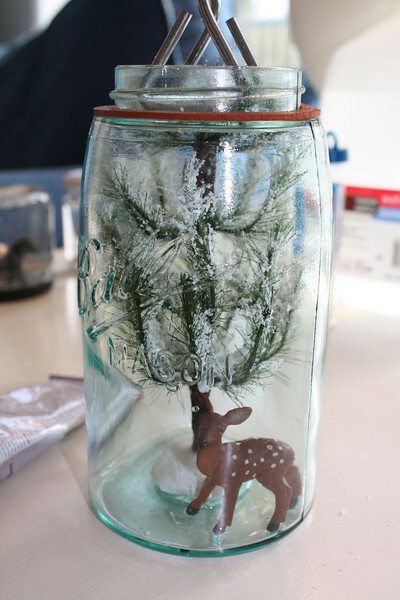 I used a 1/2 gallon vintage Mason jar for this one and followed the same process shown above for the deer terrarium. The kids had a ball making these! Apply generous amount of glue (I should be using Epoxy here) to the bottom of your decoration and attach to the inside of your lid. 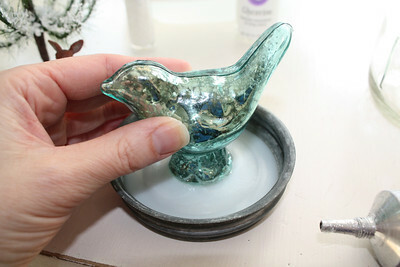 *I found the cute little glass bird at Cost Plus. 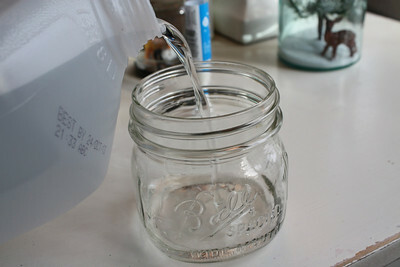 Fill your jar almost to the top with distilled water. 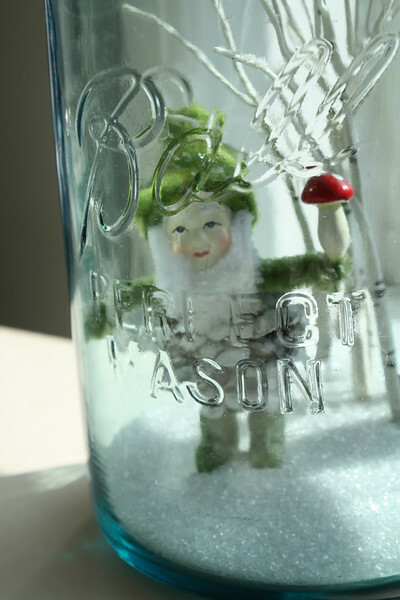 This is a 1 pint wide-mouth vintage clear glass Mason jar. Add a healthy splash of glycerin (found at Michaels in the cake decorating section). 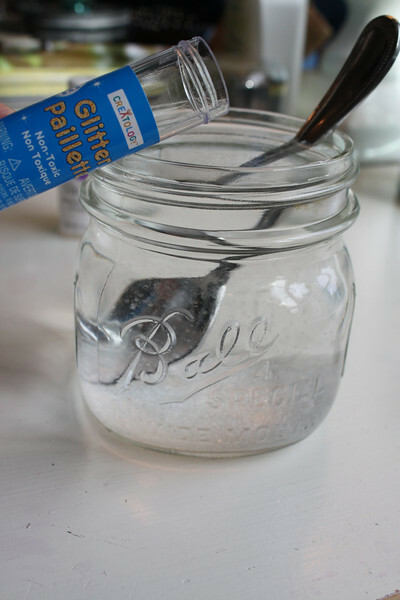 Glycerin makes the glitter flutter and swirl like real snow. 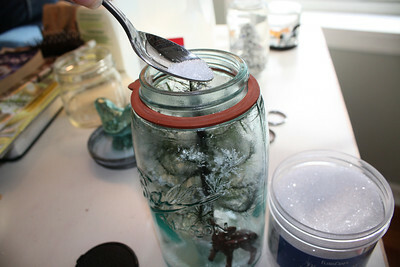 Stir and then add desired amount of coarse glitter. I am using white glitter to look like snow. 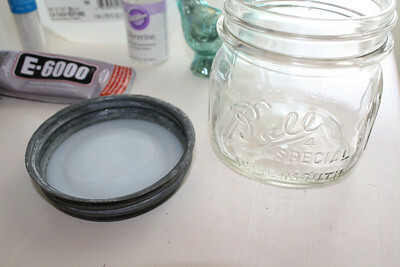 Run a generous bead of glue all the way around the inside rim of your lid. 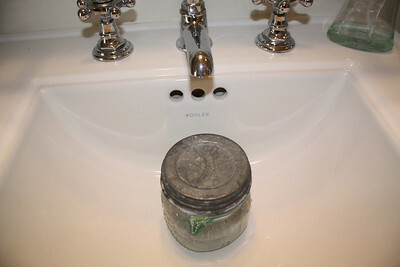 Over a sink, gently apply the lid to the jar and screw it on tight. It is normal for some water to leak out while you do this. 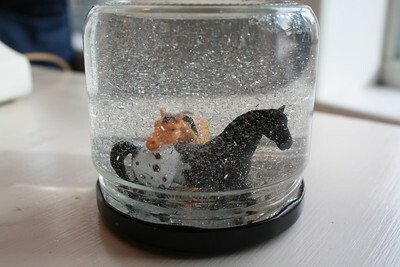 I allowed the glue to set for a bit before I played with the snow globe. 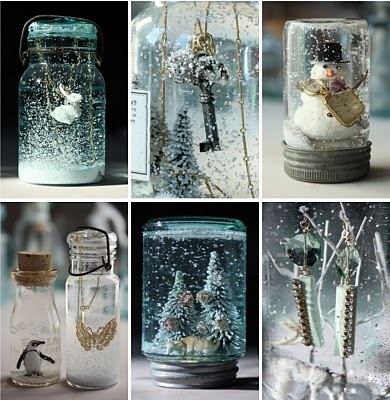 Turn your jar over, shake and enjoy the beautiful snow. 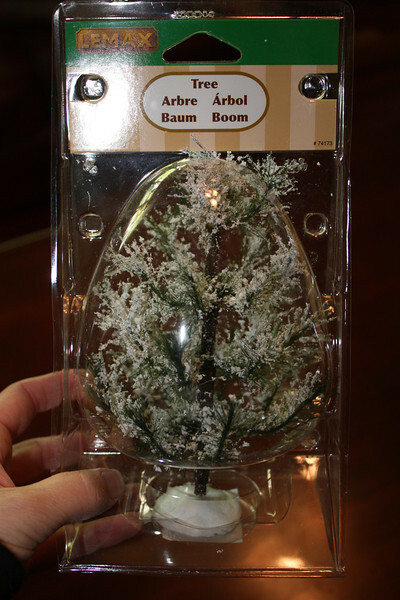 While you can use any fake tree making a terrarium, trees used in snow globes must be all plastic. 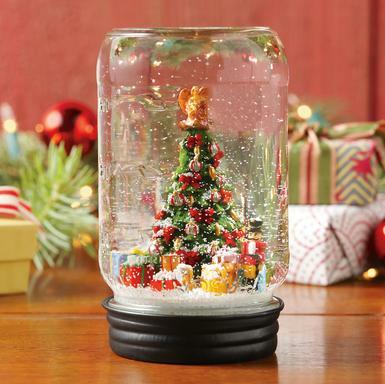 Make sure whatever item you choose for your snow globe gets tested in water first. I found that the cute little bottle brush trees at Michaels bleed and turned the water green. The trees that didn't bleed but had a metal trunk rusted :-( I think the only tree that works in these are trees that are all plastic. 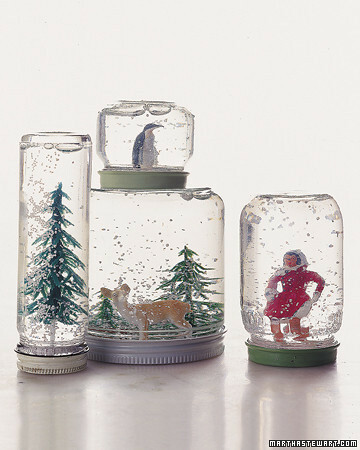 I found the little plastic figures for snow villages worked great in the snow globes, along with all plastic toys and ornaments. Glass decorations also did really well. 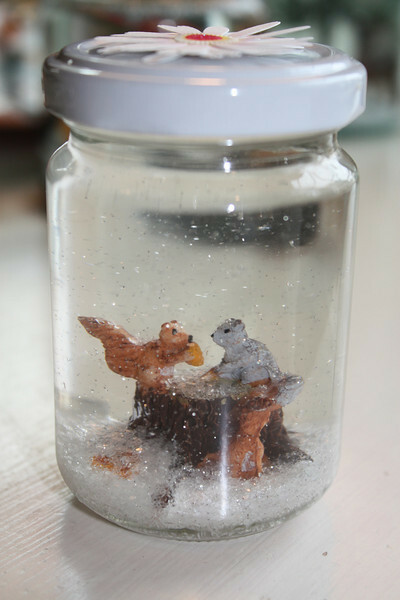 As promised, my kids' snow globe creations made with household jars. The kids had a blast digging through their toy bins for little plastic animals, etc, to make these. 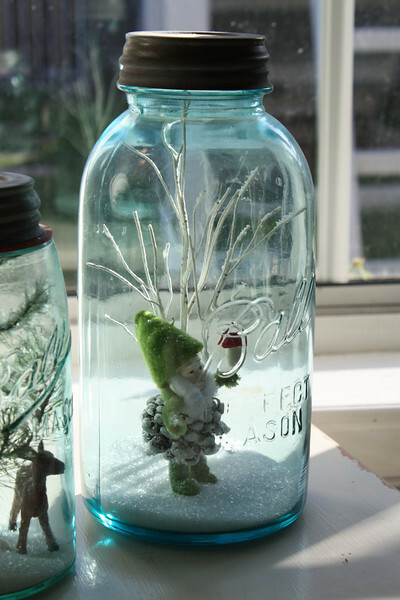 Kids can select and wash their jar, pick out and set up cute things to go inside and even decorate the lid when the jar is complete. HOWEVER, unless you want to contend with a little hand permanently glued to the kitchen table (don't ask), kids should NOT use epoxy glue. Leave the gluing to an adult. My daughter wanted to try gluing her toy squirrels to the bottom of the jar and it worked fine and she decorated the lid with a paper flower sticker. 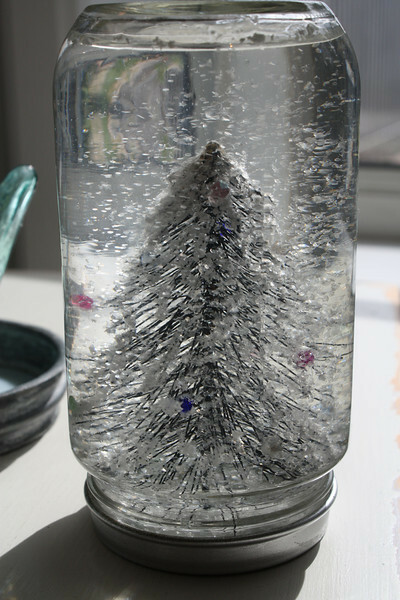 As you can see, as long as you water test your decorations, the sky is the limit as to what you can do with these. 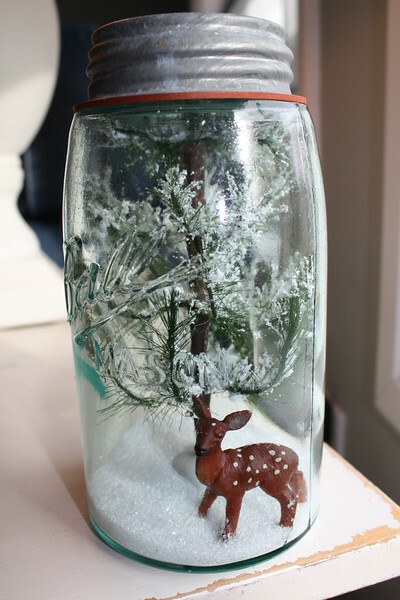 The terrariums I've made are water free so just think of the possibilities! 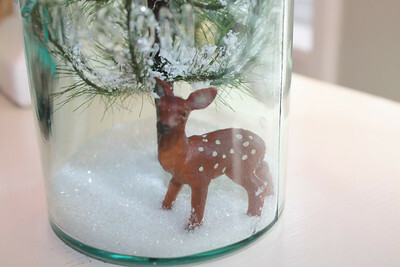 Glass jar snow globes and terrariums are a fun way to make your days merry and bright. ***If you enjoyed this post, see my 2013 Winter Scene Cupcake in a jar! It's an easy tutorial and a perfect gift. 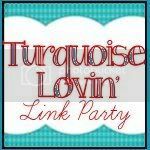 and Oasisaccents Sunday's Best link party. These are just sweet as can be! Can't wait to try this and maybe even get my two year old in on the action! 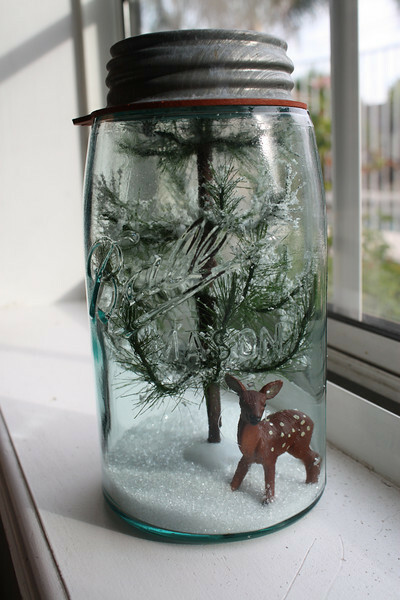 Hi Erin, I wanted to let you know that I will be featuring your snow globe tutorial that you linked up last week to Christmas Craft Tutorial at Project Queen. Thank you so much! Hope you return this week. I have 3 parties going on right now (I'm crazy). I'd love for you to share. I enjoy seeing your projects! Hey there! I totally love this idea! Thanks so much for giving a tutorial! I teach 4 year olds and do a snow theme in January. How fun it would be to do this as a project! Totally cute! Thanks so much for sharing this with us. This is really a great project that I'm going to try. thanks also for sharing at Sunday's Best. Thank you so much for this! Now I know why I've been saving salsa jars all year. I love the deer one with the tree. Now a new follower! Super cute! This is perfect:) I am seriously loving your post! It is so informative and I think my subscribers would really enjoy reading this. I would love for you to come share it at Frugal Days, Sustainable Ways on Frugally Sustainable (http://frugallysustainable.blogspot.com/2011/11/frugal-days-sustainable-ways-2.html). I really hope that you will put Frugal Days, Sustainable Ways on your list of carnivals to visit and link to each Wednesday! Would it be okay if I pinned this to Pinterest? So, so cute! Thanks for the great tutorial! That should say "why IS hot glue not acceptable?" The hot glue is not water tight. 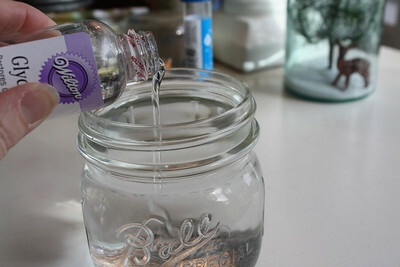 You could use it if you are not filling the jars with water. 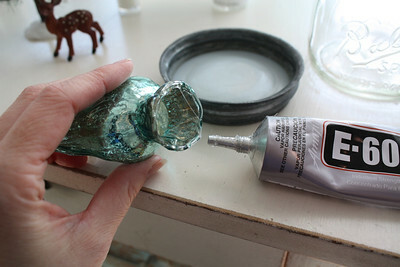 If you use hot glue with water, they will eventually leak. What a sweet, sweet project. 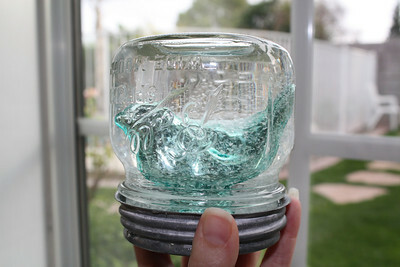 Thanks for sharing..
(Do not use hot glue) I wish I would have seen this post before I tried to make my own snow globe. Lol, it didn't really work but it's still pretty even if the lid leaks, I have it setting up on a shelf until I find a better jar. 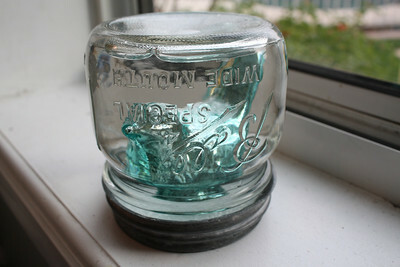 Food jars don't seem to have a good seal, at least mine don't. Great post, I really enjoyed the pictures. Love your tutorial. Wow am I motivated. One thousand ideas are dancing in my head. Can't wait to get started. Thank you for contributing. Thank you for sharing your gifts, and this beautiful site. Your creations, your kids creations, all came out like fine craft, and I am inspired! 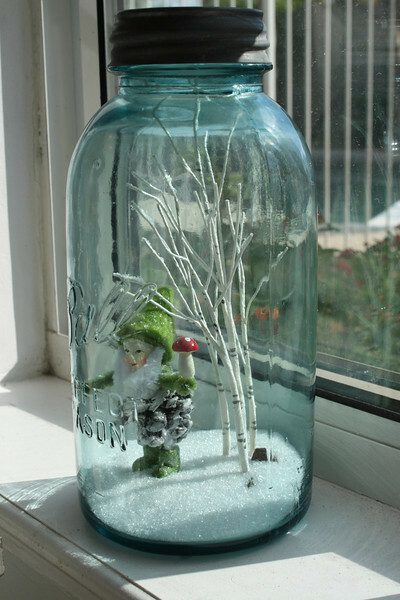 I do assemblage myself, but am really interested in what kindred spirits are up to & I may try the glycerin idea. Thank you again & may you always find joy creating magical objects of art to enchant and inspire!! Love & light, Deanna C.
Online shopping from a great selection of hanging solar lights outdoor garden, solar jar lights outdoor, solar jar lids for mason jars, solar jar lid lights, solar jar string lights & solar garden lights outdoor at Sogrand Industry Inc Store. Find the best solar jar lids for wide mouth mason jars, outdoor solar lights garden, solar garden lights outdoor stakes, solar garden decorations, solar landscape lights outdoor, solar yard lights outdoor, decorative solar light outdoor, solar stake lights outdoor & solar garden stake lights Online shopping from a great selection at Sogrand Industry Inc Store. You can also Find the best solar jar lights outdoor hanging, decorative solar jar lantern, solar jar lids for wide mouth mason jars, hanging solar lights outdoor lantern waterproof, solar glass jar lights, jar solar fairy lights outdoor decorative, hanging solar lanterns outdoor waterproof Online shopping from a great selection at Sogrand Industry Inc Store. I like your blog very much, This blog is really usefull blog and you need to update daily this blog. Find the best red decorative solar jar lights outdoor hanging, decorative solar jar lids for wide mouth mason jars, hanging solar lights outdoor lantern waterproof, decorative solar glass jar light, decorative solar jars with lights, jar solar fairy lights outdoor decorative online shopping from great selection at Sogrand Industry Inc Store. Put on table or hang anywhere you want. 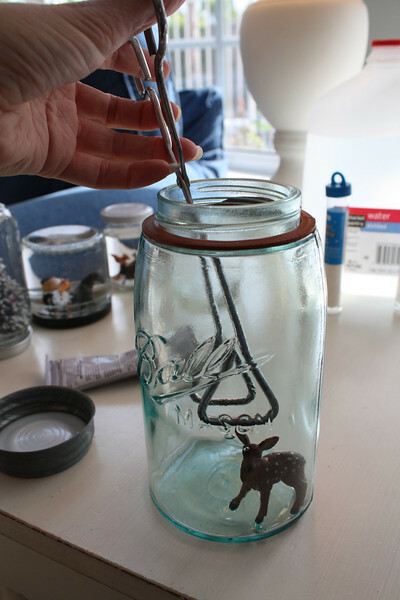 This solar glass jar has a rope handle/hanger used to suspend the jar on a hook. Get the best solar lanterns, solar jar lights, tabletop decorations, decorative jar, hanging solar lights, jar light, hanging jar and jar solar lights on amazon.com from great selection at Sogrand Industry Inc Store. Solar mason jar light - Get the best deal on party decor, bar decor, mason jar solar light, solar mason jar light, tabletop decor, solar garden decor, table decorations & garden decorations on amazon.com from great selection at Sogrand Industry Inc Store. Jar solar lights - Get the best deal on party decor, bar decor, mason jar solar light, solar mason jar light, tabletop decor, solar garden decor, table decorations & garden decorations on amazon.com from great selection at Sogrand Industry Inc Store. 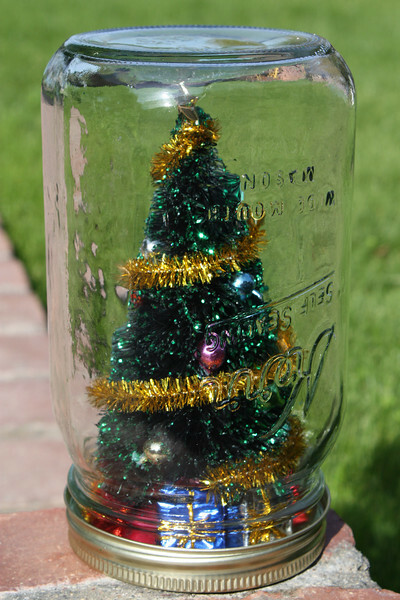 Solar jar lights, - Get the best deal on party jar, bar jar, mason jar solar lights, solar mason jar lights, tabletop decorations, solar jars, solar jar lights, table decorations, garden jars & gift jars at amazon.com from great selection at Sogrand Industry Inc Store. Solar jar lights - Get the best deal on solar jar, solar lantern, solar jar lights, hanging solar lights, solar glass jar, solar lights outdoor, solar hanging lights outdoor, hanging solar lanterns outdoor, hanging solar lights & mason jar solar lights on amazon.com from great selection at Sogrand Industry Inc Store. A Midwestern farm girl who journeyed to the Valley of the Sun, I say things like “Geez O’Pete” and call soda “pop.” A mother of two, my dyslexic brain possesses a creative flair that keeps me awake into the wee hours of the night. I just finished writing my first novel, which I'm currently back in the trenches of revising. The Lemonista pays homage to the amazing lil’ ol’ lemon tree in my own backyard that continues to broaden my world. Awesome Ham Hoagies --A Tailgating Favorite!